Great progress on everything and wonderful prize too! Oh my goodness, you are stitching on some lovely items! The Gardens of London looks so pretty! (Love the colors!!) and the witches are so cute. The M for Mary is looking good too! What a fun giveaway you received, and how lucky for you that you got the right color fabric! Thanks for the freebies, I'll have to get my thinking cap on for Easter! Thanks so much for making the internet fun! Wow, you ticked all the giftable boxes, while I ticked almost none! =D I used the extra-large shoehorn this month. Everything is coming along nicely. Wonderful stitching and gifts Jo. I will post by the end of the month. Jo: I like the old Sudbury designs, I have a few booklets, from years ago. All your stitching progress is really coming along, I am just getting back to stitching. What a nice gift and so much wonderful stitching! Good work on all the gift stitching. Congrats on the giveaway win. I so enjoy your projects, Jo. They are each beautiful, but so different. My favourite is the 12 Days sampler. It is looking great already. The M fairy is growing really fast! lovely giveaway you received. 12 Days will be so pretty at Christmastime when completed. Lovely gift from Sarah, let me know when you find the right project for the reels as I'm still trying to find one for mine. M has come on so much. Lots of beautiful work there Jo, I'm sure you must stitch in your sleep, you get so much done! What a wonderful post full of goodies. Your prize was very nice indeed. Lots of lovely stitching Gifty Goodness. Love your prize from Sarah and thanks for the link to all the Easter/Spring designs - they are all so lovely. Thanks for all the Easter/Spring links. They will come in useful. Well,my englisch is not "lovely" sorry! Congratulations on winning Sarah's giveaway with all these great things. The little pillow with the rhyme looks wonderful. I love the story behind it for you. You stitched a lot of your GG pieces. I always love to see the Witches piece. What a great collection of projects and gifts! I love seeing how things are moving along on the 12 Days of Christmas. 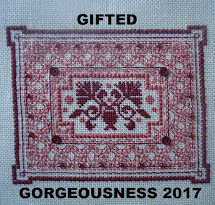 Great progress on all your gift stitches and gifts to be. Congrats on winning Sarah's giveaway too. I love this SAL it's just an awesome reminder of how generous stitchers are. Yay! Finally managed to get my GG post up - only five days late! lol! Great to see all your progress Jo! Glad that you kept the link open so I could slip in there a few weeks late. Really enjoying being part of the SAL this year!